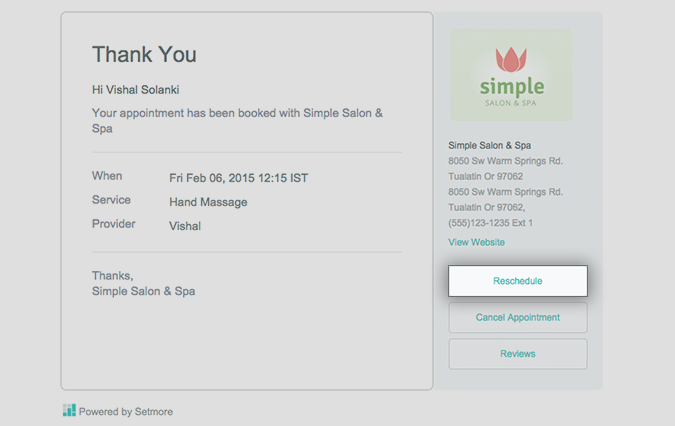 Automatically send appointment confirmations and let customers reschedule, cancel, or delete their upcoming appointments. You can also add functions to the email notifications, giving customers the ability to cancel or reschedule an appointment on their own. We'll run through each of the features and functionalities, and how to activate or deactivate them, below. 1. Navigate to Settings > Notifications > Customer. In the section titled "Send an Email," click the checkbox next to each action to enable automatic email notifications whenever that action takes place. 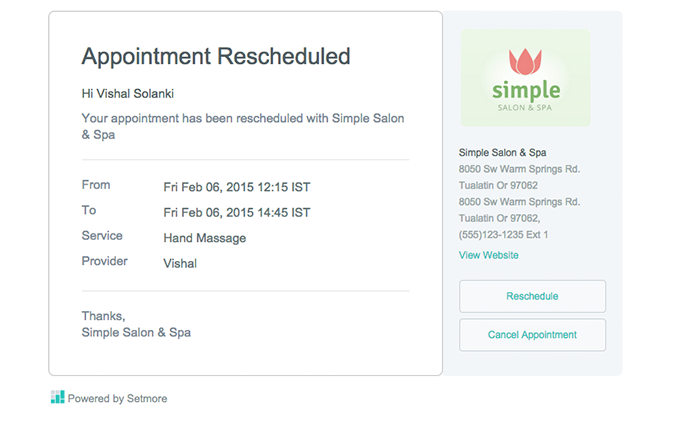 You can choose between Booked, Edited, and Cancelled for both regular appointments and classes. 2. You also have the option to add rescheduling/cancellation links and .ics attachments to your email notifications (see below for more information). 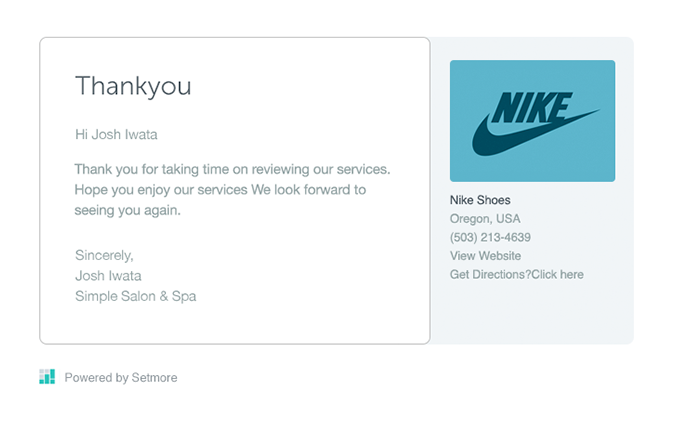 Setmore allows you to customize the sender name and signature field for all email notifications that go out to customers. This simply allows you to add a personal touch to automatic notifications and is limited to 499 characters. 1. Navigate to Settings > Notifications > Customization. In the section titled "Sender Name," end a custom name (usually your business's name). In the section titled "Email Signature," input a custom email signature. By enabling either the "Send appointment cancellation link to the customer" or "Send reschedule appointment link to the customer" option, you give your customers the ability to cancel or reschedule their own appointments. This means your customers can forego the need to call or email your business directly. This option triggers an email notification that goes out to customers whenever they post a review on your Booking Page. In order for this feature to work, you should have customer reviews enabled on your Booking Page.